Hailed as one of the best bets for holiday dance the Dance-Along Nutcracker is one of San Francisco’s most treasured holiday events that takes place at the Yerba Buena Center for the Arts on December 8th & 9th. The Dance-Along Nutcracker® is a casual, fun & family-friendly show combining the classic music from Tchaikovsky’s Nutcracker Suite with a live musical adventure featuring a talented cast. 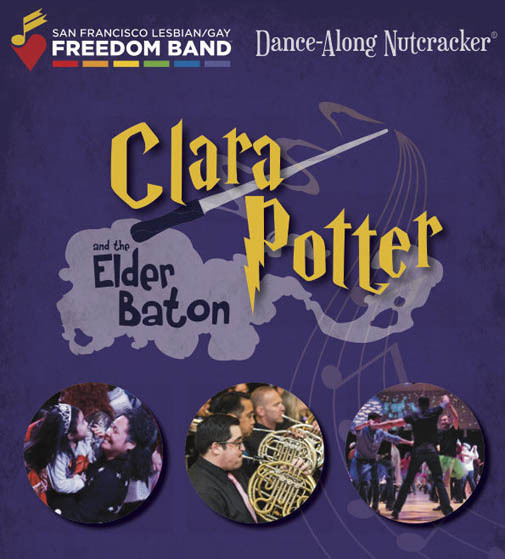 This year’s show centers on the magical adventures of Clara Potter & her friends at Fogwarts School in "Clara Potter & The Elder Baton" as they search out the long-lost Elder Baton on a quest to save their school music program. Throughout the show the audience is invited to “Dance-Along” to the ballet allowing everyone the opportunity to express themselves in a welcoming & supportive environment. Magical costumes are highly encouraged. Each year the San Francisco Lesbian/Gay Freedom Band blends Tchaikovsky’s classic Nutcracker Suite with a fun theme. The result is a fun-filled musical production brimming with wit, artistry & ingenuity. The talented cast sings & dances their way through a parody version of the Nutcracker. Then when the “Dance-Along” sign flashes, the audience is invited to tug on their tutus & sashay along with the cast. Join Clara Potter & her friends on a fun-filled musical adventure, featuring secret riddles, an evil school board, kazoos, a three-ish headed dog & more music & dancing than you can shake a wand at. General admission for adults is $35 & child, students & seniors are $20. Save 10% with code: ClaraPotter for general seating. For premium seating which guarantees first four rows tickets are adults $45 & child, students & Seniors $28.